Just a couple of shots that I think are nice shots of Dun Laoghaire Pier and Lighthouses from quite unusual perspectives. 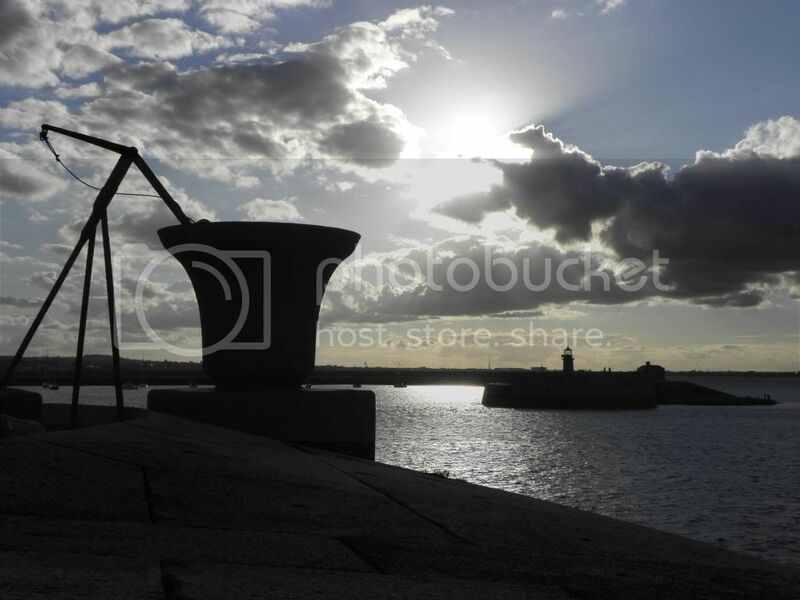 This is from inside the east pier battery looking towards the west pier. 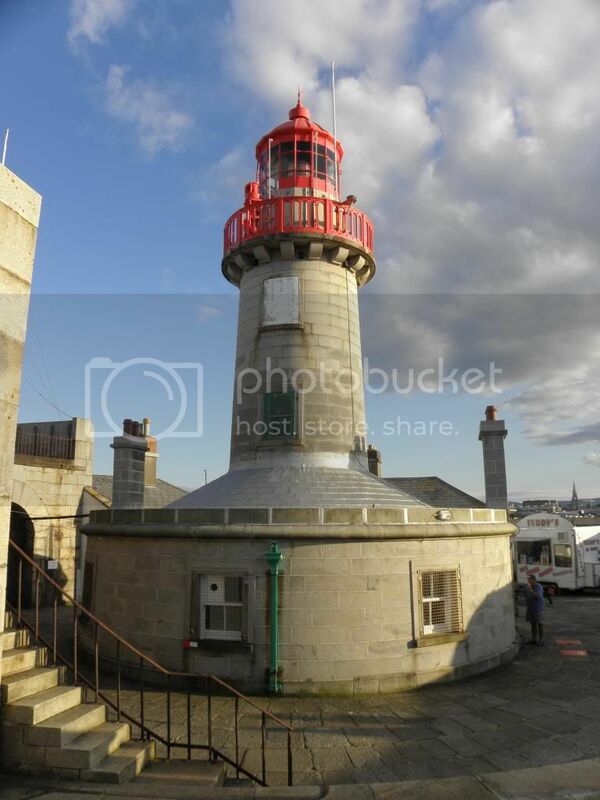 This one is the East pier lighthouse from inside the battery. Hope you enjoy. Two great shots. Thank you for posting. Great pics Jemser,I never knew that Teddy's had an ice cream van at the end of the pier.Must go down more often. Took a walk earlier today (6pm) and I had a camera with me to take a few shots of the setting sun. These pics were taken with a Canon Powershot SX210 IS point and shoot camera, no editing done on these shots. Fantastic Jem. Nice to be the right place at the right time. Absolute classics, Jemser, love them. Caught this one on the way back from the pier. What struck me about it was the clouds - (dare I say) a little like a Paul Henry painting. Shame the ship & I were both moving so fast that I couldn't get it more sharp. I cropped it to comply with "Rule of Thirds"
Yes those are Paul Henry clouds.Good one Micheál. Great photos -those boats look very close together Micháel. Whos Paul Henry when he is/was at home ????? He was a great Irish artist and his work sells for a huge amount now. Not to be confused with Theiry Henri (who was quite good with his hands too). nealy as good as our Strum.Our Artiste in residence. Last edited by Rocker on Thu Feb 05, 2015 9:23 pm, edited 1 time in total. All the chess boards are incorrectly positioned. They need to be turned 90 degrees so the bottom left square is black. Do YA bring yer own pieces ? Um yeah I was puzzled by this. The Black squares are on the left on the board if you turn it once. Am I missing something? Well, you would then be playing lengthways across the bench, stretching for the pieces. The seats are at the top and bottom of the pic, as it were. The boards are fixed to the benches and can't be moved. Anyway, it's not the end of the world; just thought I'd point it out. There's always cluedo. Gerald wrote: There's always cluedo. Ah right, but you never said anything about glue and that you were playing. You could have sat on the table in a cross-legged yoga position. Is that a peanut or a coffee bean left?